Come play across our 21 acres of palm fringed paradise. Challenge your partner to a love match on one of our two floodlit tennis courts. Dive anytime within the opening hours into each of our three outdoor temperature-controlled swimming pools. Find your inner bliss or empower your inner core with our complimentary yoga and Pilates classes. Or simply stroll and swim along our fully serviced 370-metre long stretch of private sandy beach. The time is always right to dip into any of our three outdoor swimming pools, each carefully calibrated to maintain average water temperatures between a delightfully refreshing 28 – 30º C year round. Exclusively for guests (16 years and above), our infinity Chedi Pool commands stunningly blue Gulf of Oman views from its sublime beachfront perch. Shaded sunbeds and private cabanas too keep everyone cool and comfortable in the utmost privacy while the dining cabana areas, also reserved for our guests only, serves freshly prepared Mediterranean and Asian flavours. The region’s longest swimming pool by far, the aptly named Long Pool is perfect for serious workouts at 103-metres in length and conveniently located in front of our 1,500-square-metre health and spa facilities. Reserved for our guests only (16 years and above), this elongated swim spot is surrounded by generously sized sunbeds and a guests-only dining area where Japanese classics and modern twists on Asian dishes fill the healthy menu. Cossetted by blossoming gardens in our Serai Wing, The Serai Pool welcomes guests of all ages, with plenty of shade to keep comfortable and a dining menu of international favourites. What’s even better than a postcard-perfect, sun-kissed strip of sand at the seashore? Sharing it only with a select few, of course. Our private 370-metre long beach along the Gulf of Oman is for the exclusive enjoyment of The Chedi Muscat guests only. You’ll find plenty of umbrellas, towels and daybeds, as well as our team of professional attendants from 9:30 am to 6:30 pm. dedicated to exceeding your every beach need. Wind down from the day and soothe your soul while stretching your muscles with our complimentary yoga classes offered three times a week from 4:30 to 5:30 pm. Or kickstart your morning by tapping the power of your core with our complimentary mat Pilates classes, held three times a week from 9:00 to 10:00 am. Go for the gold with private yoga or Pilates available upon request. Feel like getting your Grand Slam on? Our two competition-standard, flood-lit Euroclay tennis courts are for guests only, with top of the line tennis rackets and fresh tennis balls available at no charge at The Concierge Desk. To improve your swing or for an especially challenging match, sessions with our tennis coach may be arranged through the Concierge. 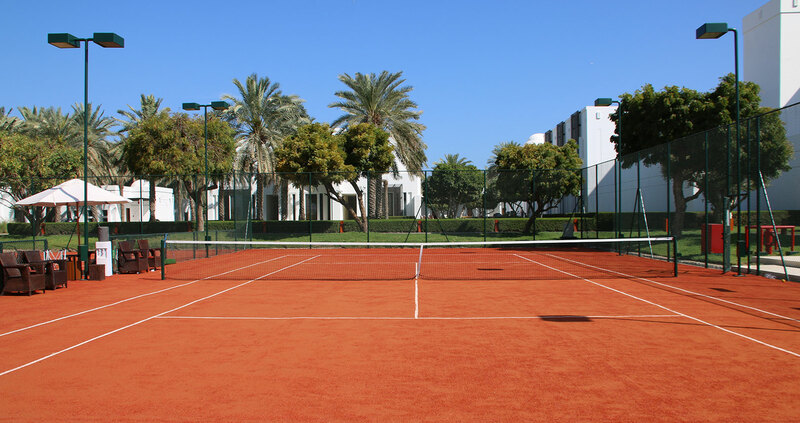 Tennis courts are available for single or double plays daily from 7:00 am to 10:00 pm with advance booking.